My dad and stepmom live in rural Indiana in a quaint ranch house on a lake with a massive vegetable garden in the backyard. It is the proverbial middle-of-nowhere, and they love it. They boast world records for completely irrelevant things, like the World’s Biggest Ball of Paint (yes, this is an actual thing that you can actually visit/see). They erect landmarks (with trails and signs and such) for the highest point in the state (Hoosier Hill, which is a whopping 1,257 feet above sea level). Unfortunately, I have not had the pleasure of visiting any of these Hoosier gems. Instead, I know all of this because these are some of the bizarre Indiana sites that the protagonists in Jennifer Niven’s new YA novel, All the Bright Places. Violet and Finch are two damaged high-school kids who meet on the first day of their last semester of high school. They surprise each other atop their school’s bell tower . . . where they are both contemplating jumping. Finch is charismatic but weird. He is tall, with dark hair and shockingly bright blue eyes. Finch’s mom works a lot and isn’t around much. His dad (a former pro-hockey player) recently left and started a new family with a younger woman (and a seven-year-old kid who may or may not be Finch’s half-brother). But Finch doesn’t miss having his dad around, because his dad went through dark spells . . . and had a tendency to take out his bad moods on Finch. Finch inherited his dad’s penchant for these dark spells—he experiences moods so dark that he is unable to function for days at a time. Violet is cute and popular. She used to be a cheerleader and date the hottest guy in school, but then she got in a car accident with her older sister. Violet escaped with just a few cuts and bruises, but her sister didn’t survive the crash . . . and Violet hasn’t been the same since. She hasn’t ridden in a car, she quit all of her extracurricular activities, she broke up with her boyfriend. She walks around in her sister’s glasses (that are too strong for her eyes) and wishes things were different. Violet: Why do you want me to do this project with you anyway? Me: Because our mountain is waiting. Violet: What’s that supposed to mean? Me: It means maybe you never dreamed of seeing Indiana, but, in addition to the fact that we’re required to do this for school, and I’ve volunteered—okay, ambushed—you into being my partner, here’s what I think: I think I’ve got a map in my car that wants to be used, and I think there are places we can go that need to be seen. Maybe no one else will ever visit them and appreciate them or take the time to think they’re important, but maybe even the smallest places mean something. And if not, maybe they can mean something to us. At the very least, by the time we leave, we know we will have seen it, this great state of ours. So come on. Let’s go. Let’s count for something. Let’s get off that ledge. Violet finally succumbs, and the two set off to see all of the wondrous sites that rural Indiana has to offer. And, in the meantime, they fall in love. Several years ago, a boy I knew and loved killed himself. I was the one who discovered him. The experience was not something I wanted to talk about, even with the people closest to me. To this day, many of my family and friends still don’t know much, if anything, about it. For a long time, it was too painful to even think about, much less talk about, but it is important to talk about what happened. As a result, the book feels very honest. Like other solid YA books, it is not condescending or falsely happy-go-lucky. Niven acknowledges that teenagers go through real pain and real love. There are some adults that get nervous when books targeted at young people deal with serious issues in an honest and straight-forward manner. I think it’s a safe bet, therefore, that we’ll be seeing this one on some banned-book lists in the coming years. At least it will be in good company. Who should read it: Lane (i.e., fans of YA books with quirky couples, like Eleanor & Park); Tina (i.e., Indianans who enjoyed Looking for Alaska). 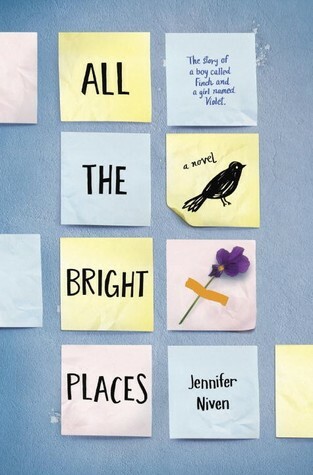 This entry was posted in Rating: 4/5 and tagged All the Bright Places, Book review, Book Reviews, Books, Jennifer Niven. Bookmark the permalink. Indeed! Bungee jumping out of your window seems like a brilliant idea! Perhaps you should skydive off the roof next?